This landscape photography weekend is suitable for absolutely any level of experience and any camera, phone or device that takes photographs can be used during this long weekend of landscape and seascape photography. The emphasis is totally on composition, planning and using natural light to take great landscape photography as well as visiting countless spectacular locations. We’ll explore many different types of landscape, seascape and subjects during this weekend as we learn to work with the many different types of terrain found on the Dingle Peninsula. As with all our tours, workshops and holidays, we’ll take the backroads whenever possible and get to see many features of the area, hidden well away from the main roads. 3 nights Includes single room, breakfast, dinner and all photography activities. 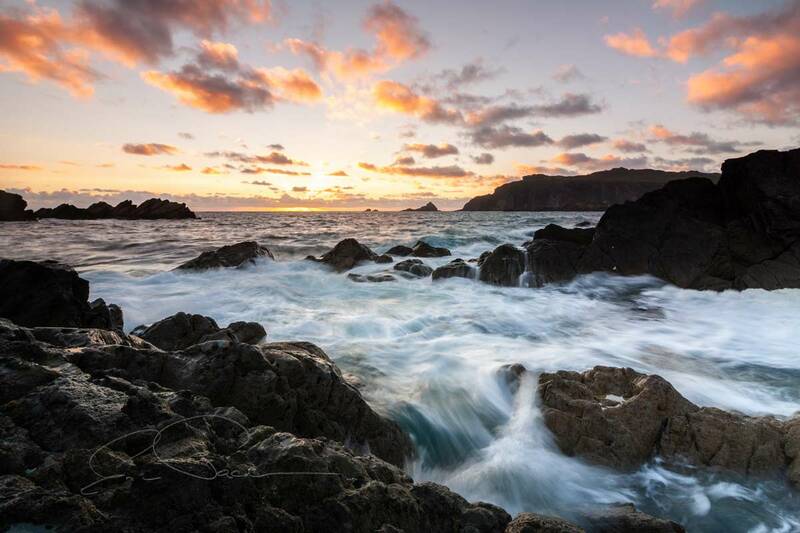 Arrive and meet at An Portan in Dunquin for Tea and Coffee 3.00 – 4.00 p.m.
4.00 p.m. A visit to the beach and rocky shoreline in Dunquin provides the first opportunity to relax and work with the landscape. 7.00 p.m. Tour with visits to a number of different locations on the Slea Head Drive until sunset and dusk, back to An Portan around 9.00 p.m.
5.30 a.m. – 8.30 a.m. We visit a location for sunrise and take advantage of the early morning light and atmosphere to the west of Dingle. 8.30 a.m. Back to An Portan for breakfast, time to rest, relax or explore as we continue our activities at 1.30 p.m.
6.00 -7.00 p.m. Dinner at An Portan. 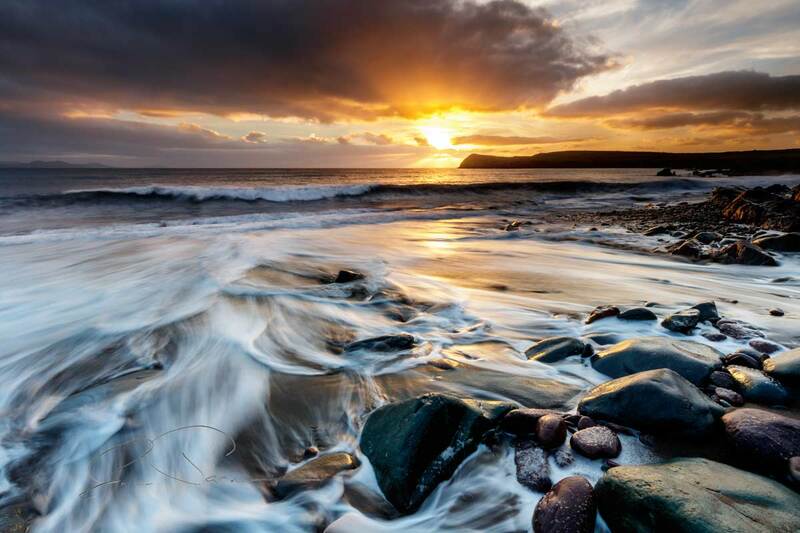 7.00 p.m. – 9.00 p.m. We’ll explore a section of amazing rocky coastline during the early evening before picking our own spot for sunset and dusk. All the locations we visit during the weekend are easily accessible with a short walk using paths, tracks or reasonably level ground from where we park. There is also a range of filters, holders and tripods available for everyone to use as they wish during the weekend. In the event of unfavourable weather conditions, the schedule of activities may change and we may even relocate indoors taking full advantage of An Portan’s spacious conference and sitting room. 5.30 a.m. – 8.30 a.m. We’ll visit another location for the dawn & sunrise, continuing on to even more spots to catch the early morning light. 8.30 a.m. Back to An Portan for breakfast, time to rest, relax or explore on your own as we continue our activities at 1.30 p.m.
5.30 -8.30 a.m. Our final dawn, sunrise and early morning tour. 9.00 -10.30 a.m. Breakfast at An Portan. 10.30 a.m. – 1.30 p.m. We’ll spend the morning looking through the images we’ve captured during the weekend and examine the things we can do “on location” or in post processing to improve them. Landscape and scenic photography at beautiful and stunning locations, composition and balance, how to stimulate the viewer and lead the eye, reconnaissance, planning, filters and equipment for landscape photography, five participants with group and 1 on 1 sessions and demonstrations. Includes single room, breakfast and dinner for 3 nights, and all photography activities. 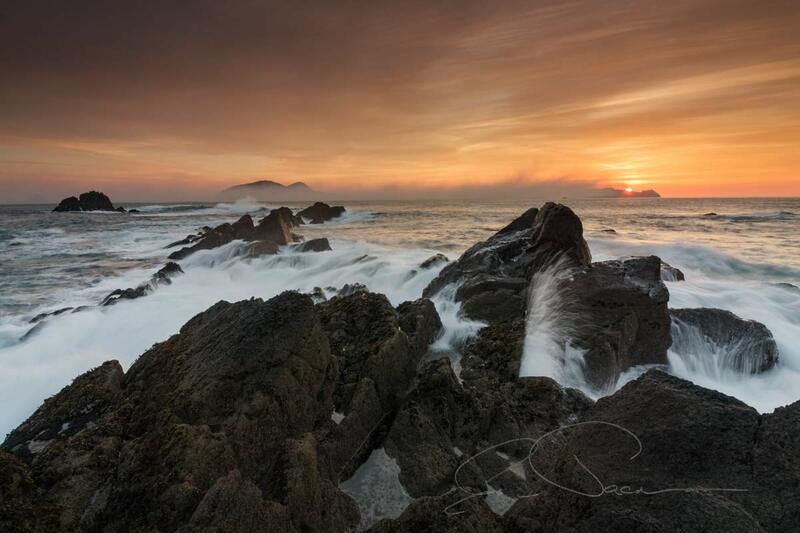 Location: An Portan, Dunquin, Co. Kerry, Ireland. Non-participating sharers are welcome, please use the contact form below for details, or indeed if you have any other enquiries. Includes room, breakfast dinner and all photography activities. Receive an occasional newsletter from us. Great! Please don't forget to check your spam folder to verify!